One of the finest songs I've heard all year is "Oh Mandy" by the Spinto Band. The first time I heard it I thought it was just okay, but it has growed on me so much its one of those songs I just start humming out of habit. 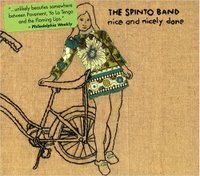 Reminding of Pavement and the Flaming Lips, the Spinto Band are one of those blogger dream bands, and a cute little story about their genesis says that the songs were written on the back of a Cracker Jack box by one of the band members grandfather. I don't know if that's true, but I like it. They even incorporated 'cracker box' into their website address. i just heard this song a few days ago, and i was gonna post it. i really like it a lot also. i've been trying to find some more stuff by the band, but i haven't found anything. definitely a nice, catchy song. This is a killer find. The vocals in the bridge are insanely identical to the guy from CYHSY.